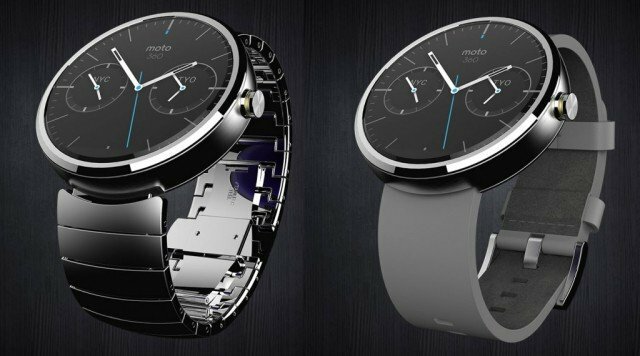 Motorola has launched its highly anticipated circular smartwatch, the Moto 360. The company said it believed the smartwatch model offered a stylish design after what it suggested had been a series of unappealing wearable tech launches by its rivals. The release of the Moto 360 comes at a time of transition for the business. Sales of Motorola’s smartphones are on the rebound and the business as a whole is about to switch ownership to Lenovo. While analysts have been generally positive about the look of the new timepiece, they expressed doubts about its potential to become a bestseller. Motorola also unveiled new smartphones and a small Bluetooth earbud designed to allow owners to interact with their handset by voice. The Moto 360 features a 1.5in LCD touchscreen encircled by a thin metal band. The waterproof device is powered by Google’s new Android Wear operating system – which is designed for small screens – and also features a built-in heart rate monitor and pedometer step counter, but no proprietary sleep monitoring software. It only lasts about a day between charges. The version already on sale in the US has leather straps, and versions with metal bands will follow. Motorola’s president, Rick Osterloh, suggested it was a clear improvement on competitors’ earlier models. “I think the first watches that shipped have been really bad,” he said. “A number of manufacturers were willing to ship products that I felt were not appropriate for consumers. “The biggest problem consumers said they had with them was that they really didn’t look appealing. Rick Osterloh added that he welcomed the prospect of Apple entering the sector, potentially as soon as next week. “I think Apple is going to help grow the category,” he said. “Perhaps the most difficult thing in any new technology category is having people understand the benefits of it. Although Motorola was the first of the major tech firms to show off a circular smartwatch design, LG has since announced its own model, the G Watch R, with a similarly shaped face. Motorola may be at a disadvantage because part of its model’s screen remains dark to make room for other components, leading some critics to suggest it resembles a “flat tyre”. The company avoided this by building a thicker bezel, placing the parts behind it and not including an ambient light sensor. Rick Osterloh played down the issue noting that the Moto 360’s screen was larger than those of its competitors. However, experts suggested consumers might still prove hard to convince. Motorola’s other new wearable is the Moto Hint, a discreet Bluetooth earbud. Offering three hours of talk time between charges, the idea is for owners to use the add-on to activate and control their handset from up to 150ft away as well as to make calls. Motorola suggests it could be used by pedestrians to get directions without having to repeatedly check their phone’s display, and would be a convenient way to get quick answers to questions. In addition, Motorola announced the Moto X+1, an updated version of its top-end phone whose case can be customized at point of order. A leather back is among the new options. Four infra-red sensors have also been added to its front to allow users to wake it up by waving their hand six to 12in above it – something the firm suggested could be useful in meetings to surreptitiously check for notifications. Motorola also updates its lower cost Moto G, which now features an improved processor and display. The original model is the bestselling handset in Motorola’s history, and has played a large part in reviving its fortunes.